We have done store-bought playdough in the past. 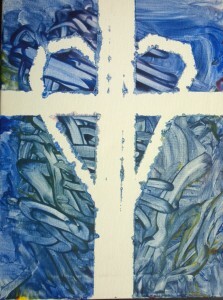 In terms of consistency, it is great I know what I am getting, but it can get expensive to have to continually replace. I also prefer homemade because then I know first hand what is going into the product, and then the girls can also get involved in creating it. I have tried my hand at both cooked playdough recipes, which for us were a flop, and no-cook recipes. 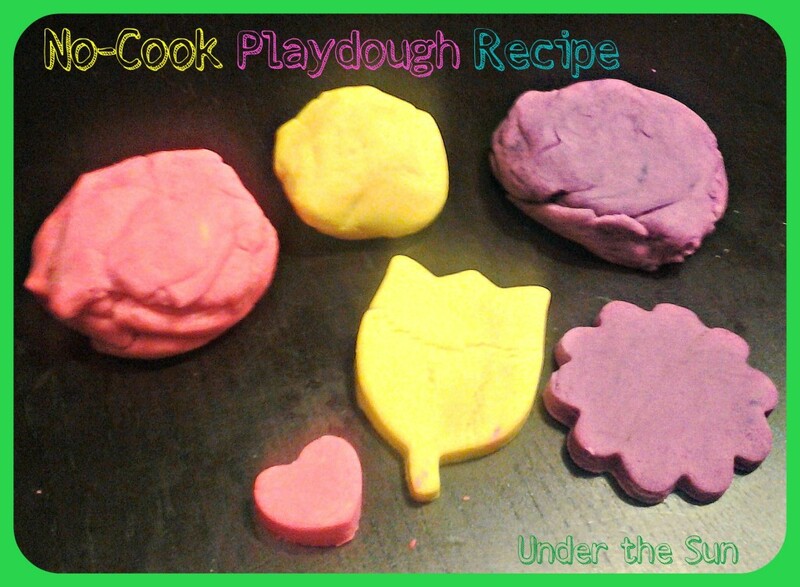 A simple Google search led me to The Best Ever No-Cook Play Dough Recipe. Anna, the author of the blog, offers up this simple recipe. It creates a soft dough that the kids have used for the last two days and there have been no signs of drying out. It produces a great end result that I will turn to again and again. Mix the flour, oil, and cream of tartar in the bowl of a stand mixer. On a low-speed add the oil. Add the boiling water in 1/4 cup increments mixing until the dough is smooth. If you still have tacky sticky dough and the mixing is not helping go to your flour reserve, and add a 1/8 cup at a time till dough is smooth to touch. Store your playdough in an airtight container, and it should last for months. This entry was posted in Children, Homemade, Homeschool, Motherhood and tagged Children, crafts, Frugal, Recipe on March 12, 2014 by Sara R.
We used old white T-shirts as painting smocks. 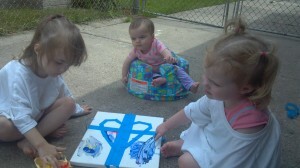 This week my girls had fun finger painting. They always enjoy when we bring out the finger paints. 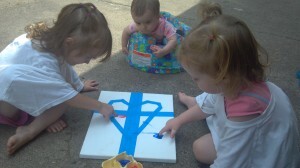 While I always love letting them have fun, I must admit I don’t love the finger paints as much as they do. It might have something to do with the level of clean up involved, usually in this particular craft. 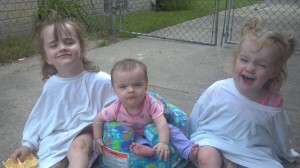 I solved most of my clean up issues by moving this project outside. I had done this particular method of finger painting once before, and I had actually been wanting to do it with the girls again. (I just love the results from this so much.) 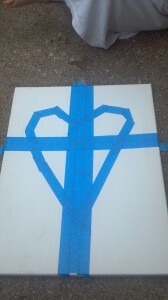 The idea for this craft came from a pin I had seen floating around Pinterest. You will need to decide on a design for the white space on your canvas and then lay your painter’s tape out in that pattern. The girls started a little hesitantly at first. This entry was posted in Homemade and tagged Children, crafts, finger painting, Kids on July 4, 2013 by Sara R.